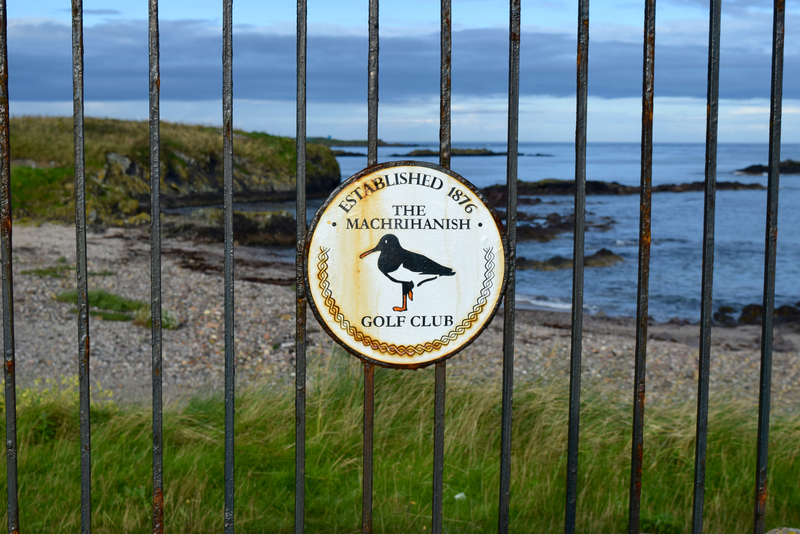 Machrihanish Bay of the Atlantic Ocean comes up to the first tee at Machrihanish Golf Club. 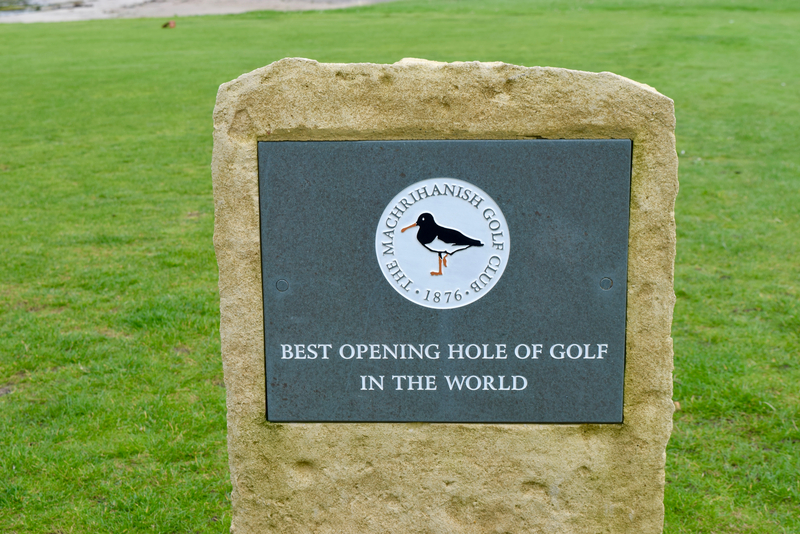 The first hole at Machrihanish Golf Club has won international acclaim. 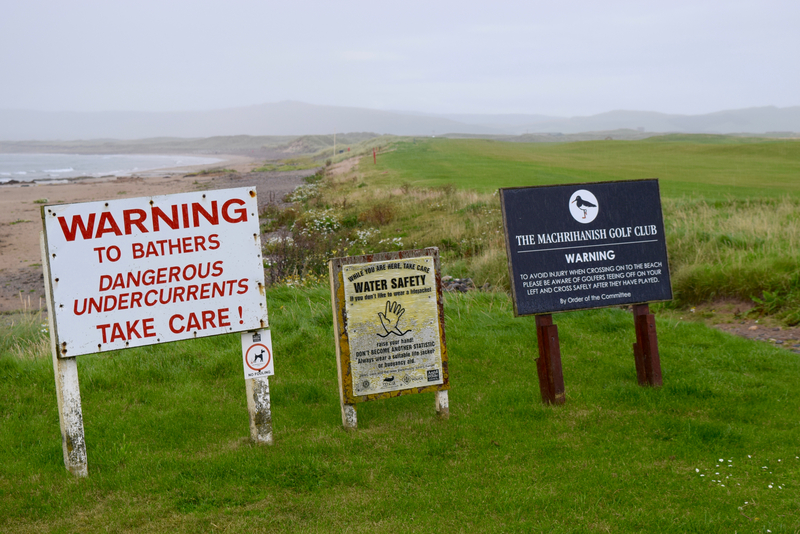 Walkers on the beach below the first tee at Machrihanish Golf Club are warned about errant tee shots. 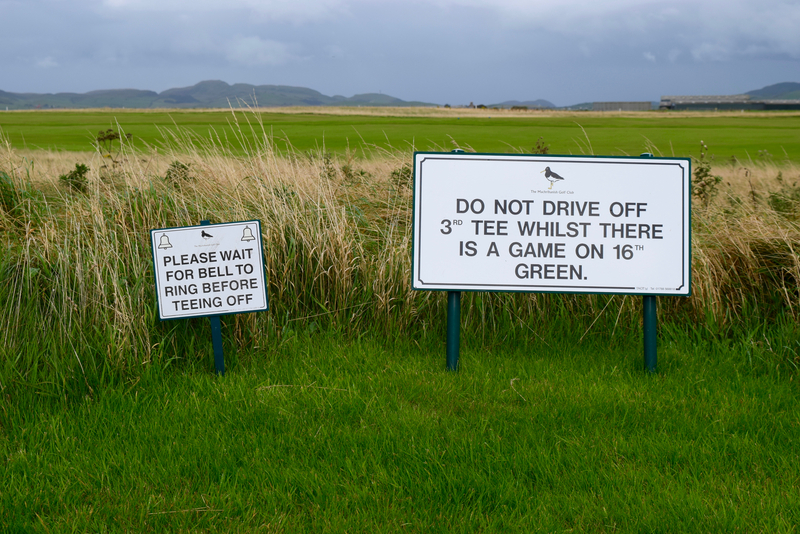 Signs at Machrihanish Golf Club, where the third tee is near the 16th green, and is a blind shot. 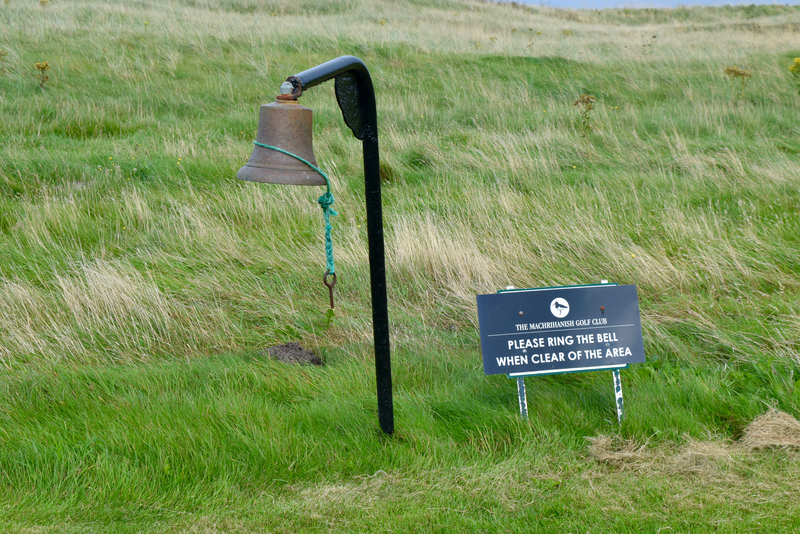 The third hole at Machrihanish Golf Club is one of several with bells, necessitated by blind shots for following golfers. 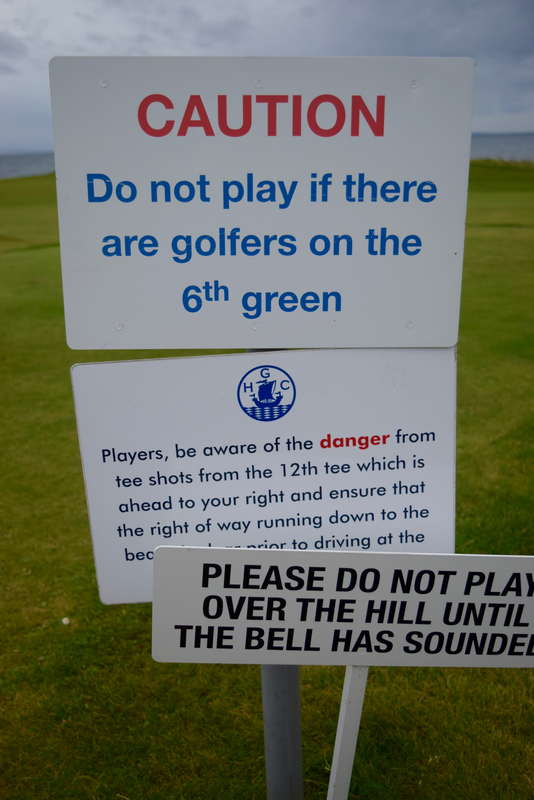 Golfers need to play smartly on the par 4 No. 1 hole at Prestwick, with a wall and railroad tracks right, and rough left. 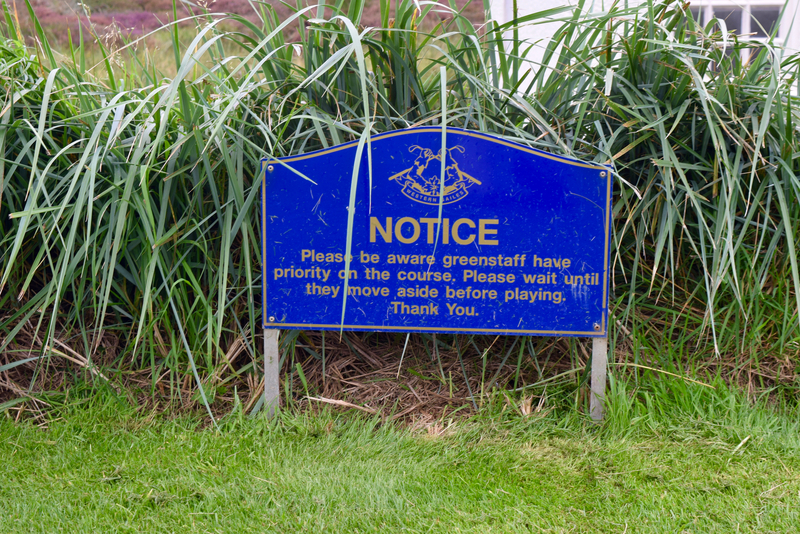 A warning sign at the first fairway at Prestwick. 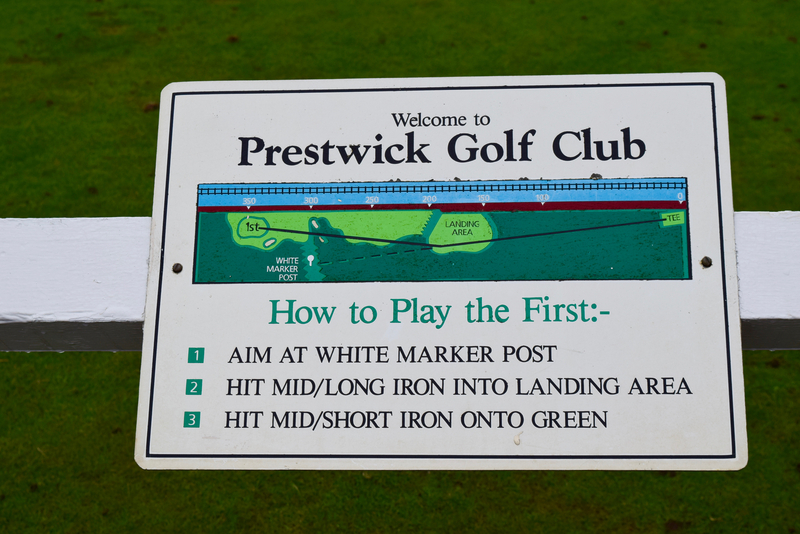 The logo of Prestwick includes old style "featherie" golf balls. 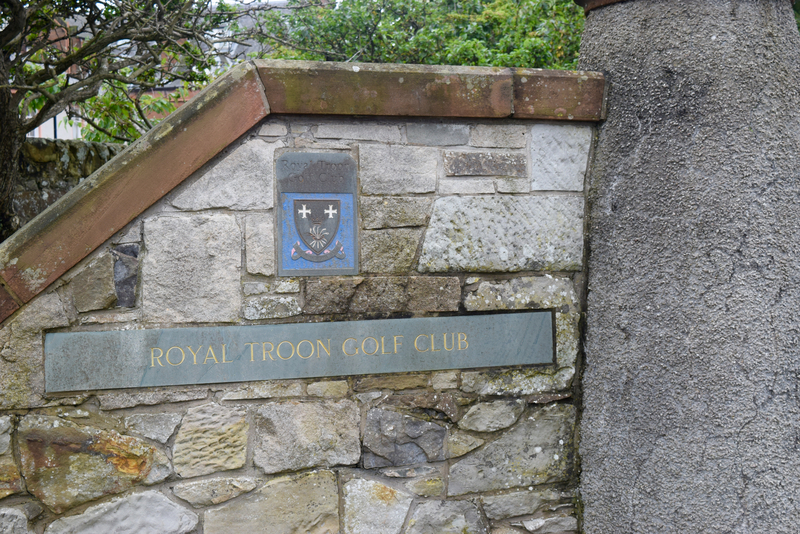 There are two courses at Royal Troon, the historic Old Course and the secondary Portland Course. 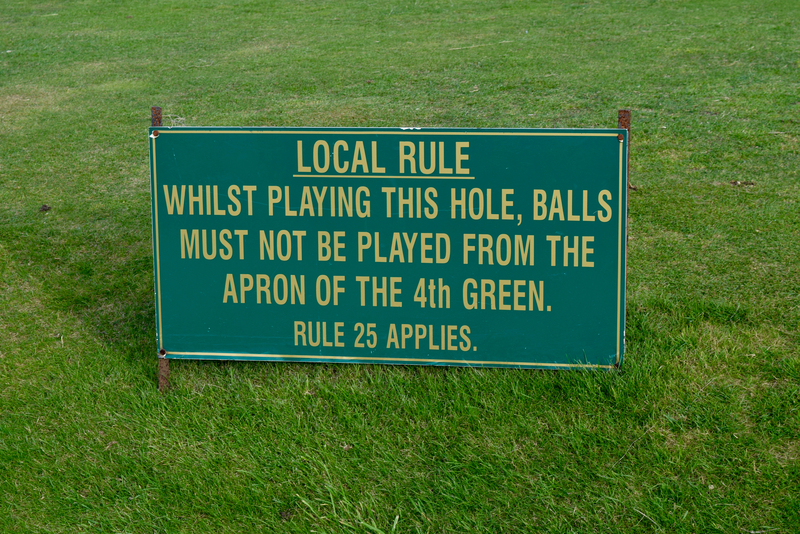 A warning sign on the No. 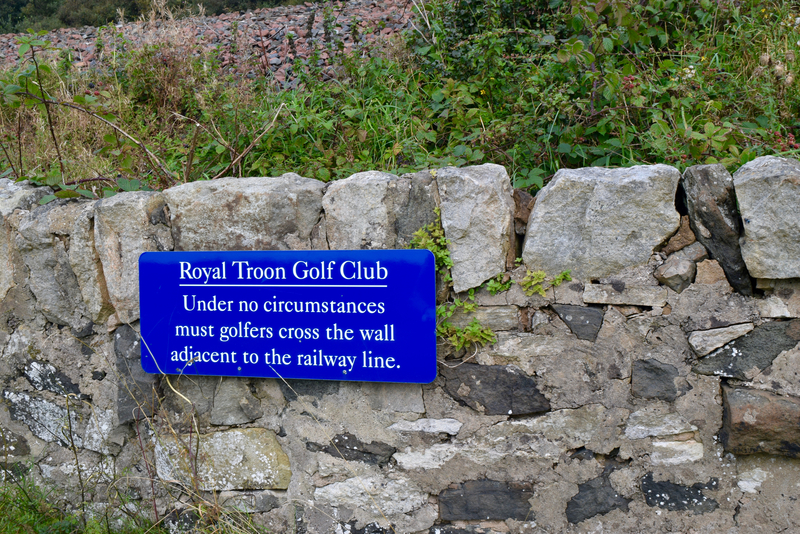 11 hole called The Railway at Royal Troon. A lot going on at the tee box for the No. 10 hole at Elie Links, a par 4 with a blind uphill tee shot. 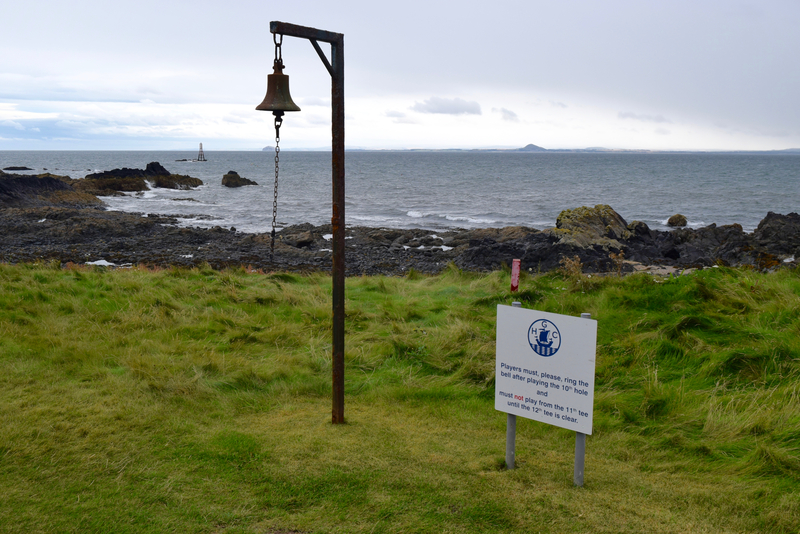 Golfers must ring the bell to signify that the 10th green is clear at Elie Links. 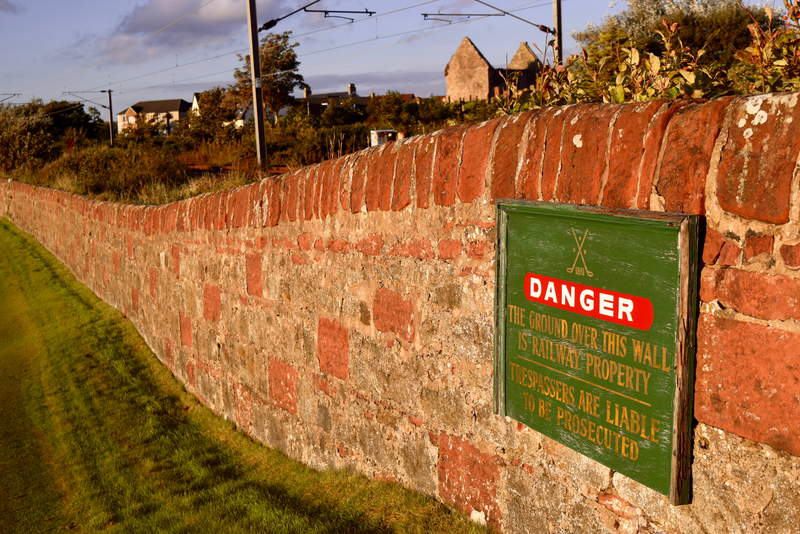 Crail Golfing Society includes two courses. A deck overlooks the No. 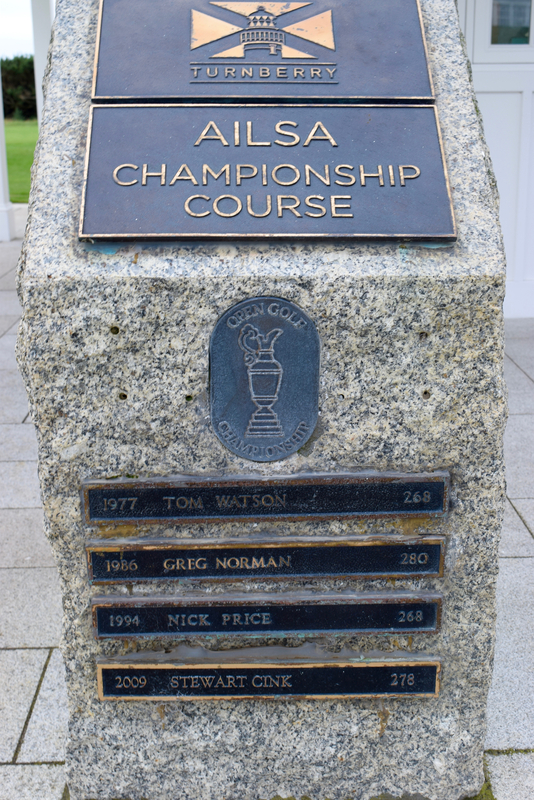 18 green at Balcomie Golf Links, Crail. 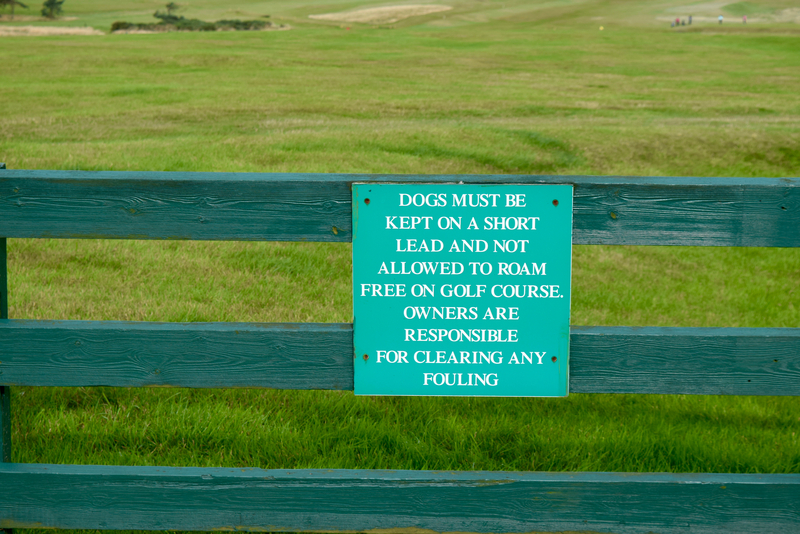 At Balcomie Golf Links, and other courses in Scotland, members of the public often cross the course to the beach. 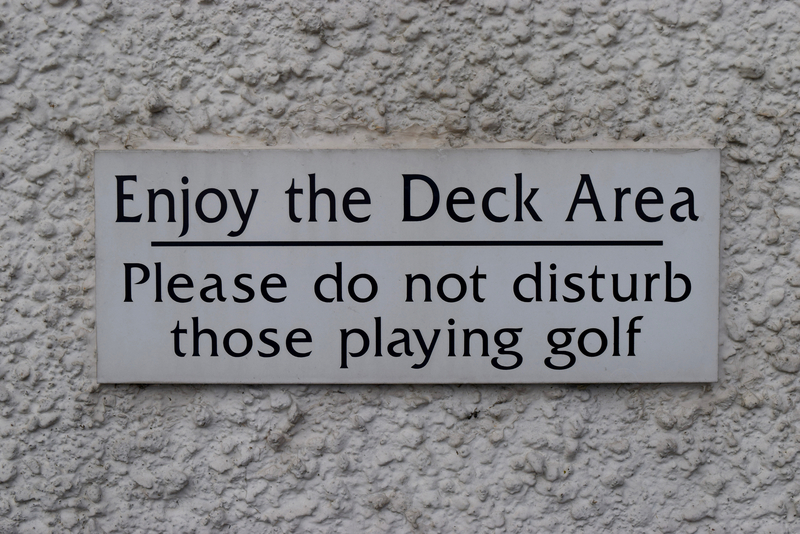 A welcoming sign at North Berwick Golf Club. 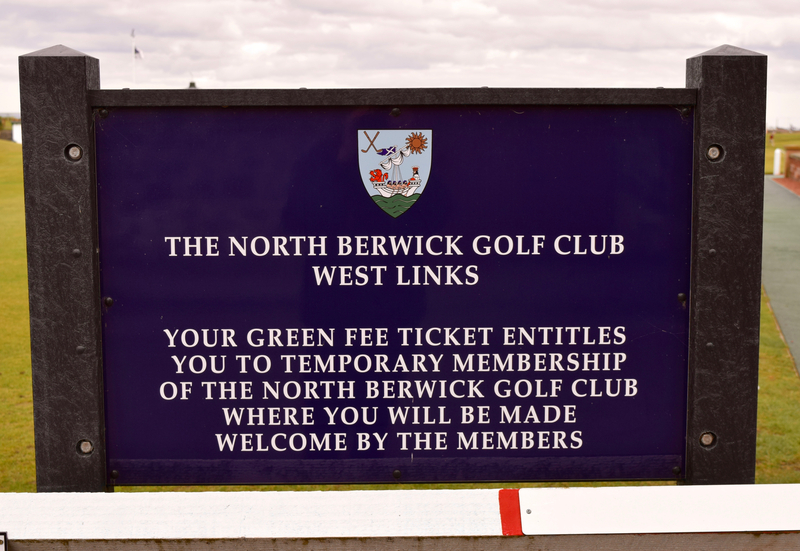 Sign at the first tee at North Berwick Golf Club, West Links. Sign by the No. 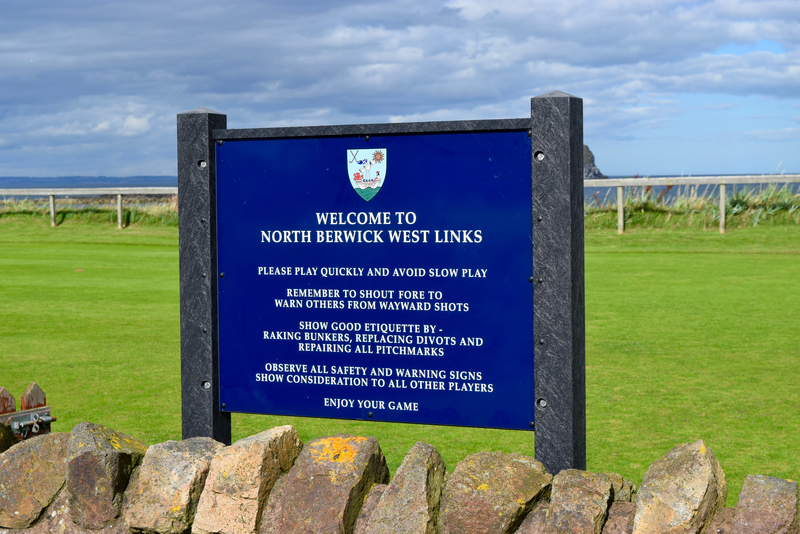 14 tee box at North Berwick, where golfers play to a green near No. 4 green. 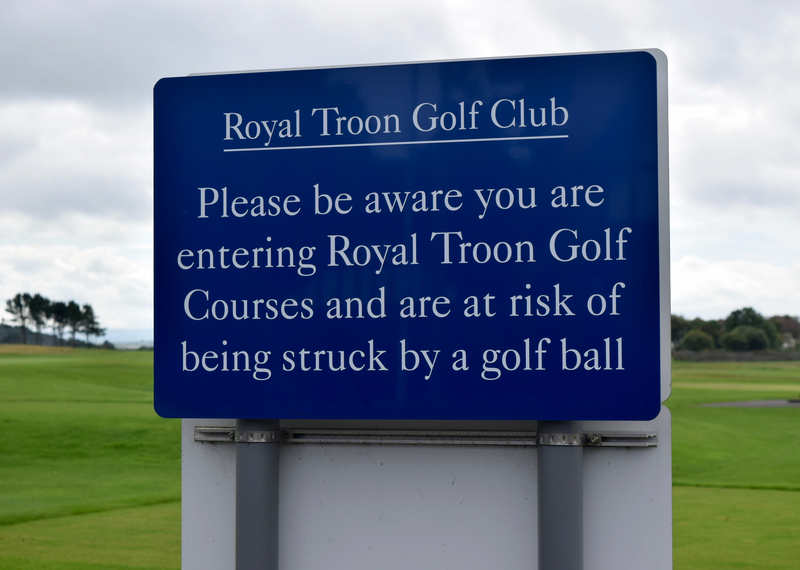 In Scotland, courses have unique signs that reflect key aspects of the golf courses.